Parking: Private parking is possible on site (additional charge). The hotel is located in a charming 19th Century building and is named after the French king Francis the 1st who was born in the town’s castle in 1494. Today the town’s main square, where the hotel is located, is named after him and there is a statue of Francis on horseback at the center of the square. 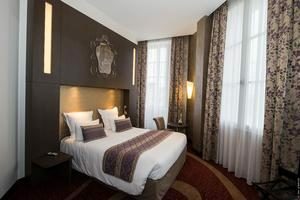 The Hotel François Premier is ideally located in the city centre of Cognac and gives you an easy access to a good range of cafés, bars, restaurants and shops. It is also the ideal base to visit the famous Maisons de Cognac which can be reached on foot from the hotel. The train station is a 15 minutes’ walk from the hotel. Cognac is located on the pretty river Charente. 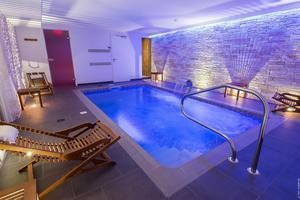 The hotel boasts a lovely spa with a heated indoor swimming pool as well as a hammam open every day from 8am until 8pm. Treatments are available on request. For those who would like to enjoy an aperitif or an after-dinner liqueur, a cocktail bar is available on site. The friendly staff of the hotel are always delighted to help 24/7. Room service is available at the hotel if you would prefer to have dinner in your room. The hotel has 21 bedrooms and 4 suites. Each room is decorated in an elegant and refined style and has an en-suite bathroom, individual climate control, complimentary WiFi, Satellite TV, tea and coffee making facilities, a minibar and a King Size or Queen Size bed.